I recovered my past memories when I was hit on the head by a rock. I am Katarina Claes, the eight year old daughter of the duke. In a feverish nightmare, in which the prince’s fiancee was determined, I have realized that this is the otome game from the previous life. Also, I have turned into the villainess that interfered with the romance of the capture targets… If the heroine got a happy end, I would be exiled, while if she got a bad end, I would be killed by the capture target… I have no happy end!? Why is it only bad!? Somehow I have to avoid the destruction end, and reach old age peacefully!! I liked this WAY more ten I thought I would. Don’t expect a super serious plot or anything, it has a few moments but mostly is just fun and silly, especially Katarina, who combines average intelligence with absolute obliviousness to be possibly the dumbest protagonist I’ve ever read, and I love her for it. Although at this point I want Anne to just sit Katarina down and explain to her “these people all love you, as in love-love” no misunderstandings, just tell her and see what happens. I’m hoping for the Harem ending myself. I beg you Please keep updating it! Pretty please! Please update! 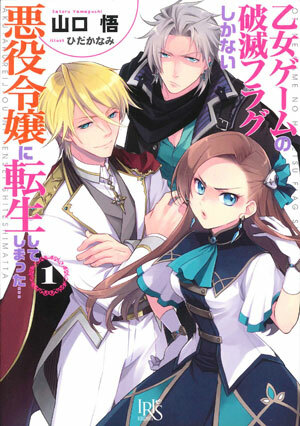 This light novel still has like 3 volumes left that need to be translated. Many thanks.